My 9th great grandfather, William Longfellow, was born in Horsforth, Yorkshire, England about 1650, well after the Great Migration of Puritans to New England. Oliver Cromwell and the Puritans had control of the government, and Puritans no longer had to flee persecution. He was the only one of his siblings who left England for New England, and he probably did not flee for religious reasons. He appears for the first time in the Newbury, Massachusetts tax records around 1676. William Longfellow appeared in quite a few Essex County court records for misdemeanors and for debt. In one case in 1677 he was found guilty of stealing wine. In one 1677 case he was unable to pay his debts and so the court made him a servant for seven years. In 1679 he was in court for fighting. In 1681, the most curious court case had Longfellow confess to killing a steer. He married Anna Sewell and had six children. Her brother, Samuel Sewell, was a famous chief justice involved in many famous early cases including the Salem Witch Trials. His diary contains a lot of information about his family, including the Longfellow family. This diary states that there were eight Longfellow children, but the Newbury records only have six Longfellow births. In 1687 William Longfellow returned to England upon hearing of his brother’s death. This left him the only male heir, and perhaps he was hoping to bring back an early inheritance from his father, who was still alive. In 1690 William Longfellow joined the Newbury Company that went with Sir William Phips to Canada in an expedition against Quebec. There were 32 ships with over 2000 men. The New Englanders were driven back and encountered several storms on the way to Boston. Many ships were wrecked, and four never returned, including the ship with William Longfellow which disappeared off Cape Breton near Anticosta on 31 October 1690. Another 1000 died from an illness that was probably smallpox. The expedition was a disaster. His wife was left a widow with six small children, and a large debt that William had accumulated during his lifetime. Anna remarried to Henry Short in 1692. I descend from William’s youngest son, Nathan (1690 -1731), my 8th great grandfather, who was only a year old when his father died. He must have been raised by his step-father, Henry Short, who had another eight children with his mother, Anna. Nathan removed from Newbury, Massachusetts to Hampton, New Hampshire where he accumulated many lots of land. He married Mary Green in 1713 and had nine children. 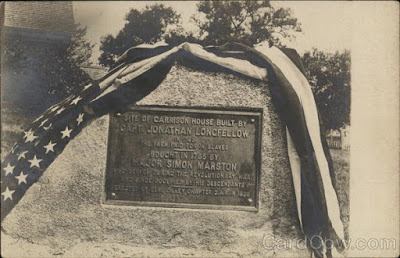 Nathan Longfellow was the constable and tax collector for Hampton. The ongoing border war between the province of New Hampshire and the Massachusetts Bay Colony came to blows during his tenure of collecting money from residents who had already paid taxes in Massachusetts. He was arrested by the town of Salisbury, Massachusetts over this border dispute. See my blog post about the Shapley Line. Nathan Longfellow died young in 1731 at age 40. His widow, Mary, remarried to Joseph Macress. I descend from the oldest son, Jonathan, who was of legal age upon the death of his father and did not require a guardian like the rest of his siblings. He was eventually given guardianship of his brother Jacob, age 14, and they together inherited their grandfather’s (Jacob Greene) estate in Hampton. 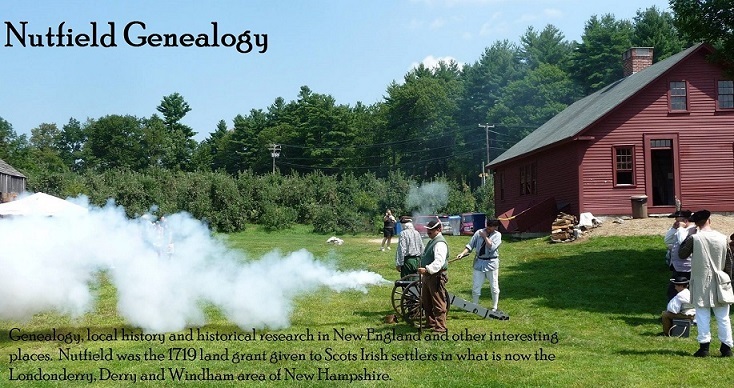 Jonathan, my 7th great grandfather, was a wealthy landowner, who removed to Nottingham, New Hampshire. This town is now called Deerfield because of some deer that Jonathan Longfellow gave to Governor Benning Wentworth, the governor of New Hampshire, in 1765 as a bribe to separate their town from Nottingham. He was wealthy enough to own several African slaves which he sold to buy his land in Nottingham. Jonathan married Mercy Clark in 1731 and had twelve children. They removed to Cornwallis, Nova Scotia during the planter movement in 1764 but only stayed 5 years. They sold their land in Canada to their son, Nathan, and removed to Machias, Maine with the 3 youngest sons. Mercy is buried in Cornwallis, and Jonathan is buried in Machias. I descend from his daughter, Mary (1735 – 1814), who married Nathaniel Batchelder. Her sister, Sally (1739 – 1811), married General Joseph Cilley, a hero of the 1st New Hampshire Regiment with Robert Rogers during the French and Indian War. Mary Longfellow and her husband Nathaniel Batchelder, my 6th great grandparents, had eight children born in Deerfield. Nathaniel at Valley Forge in 1778. Mary received a Revolutionary War widow’s pension. In the pension papers there was a testimony sworn by a Benjamin Page which stated “in Scammel's Regiment about one year until he died at Valley Forge in March 1778. Stephen Batchelder, a brother of Nathaniel, Senior, and an uncle of Nathaniel, Jr. also served in Scammel's Regiment with me until he died in the fall of 1777. I further testify that Nathaniel Batchelder, senior, who served with me in Scammel's Regiments was a sergeant, and my recollection is that his son, Nathaniel Batchelder of Cilley's Regiment, was a corporal." The Granite Monthly newspaper ran a short note "Nathaniel Batchelder, who was a brother-in-law of Col. Cilley [Joseph of Nottingham] fought in the battle of Bunker Hill, under Capt. Dearborn and was Adjutant in Col. Drake's regiment which did brave service in the battle of Stillwater, Saratoga, and the surrender of Burgoyne. He died of fever at Valley Forge, March 18, 1778"
Generation 1: William Longfellow, born about 1650 in Horsforth, Yorkshire, England, died July 1690 at sea off the coast of Anticosta, Cape Breton, Nova Scotia; married on 10 November 1678 in Newbury, Massachusetts to Anna Sewell, daughter of Henry Sewell and Jane Dummer. She was born 3 September 1662 in Newbury, and died 18 December 1706 in Newbury. Eight children. Anna remarried to Henry Short. Generation 2: Nathan Longfellow, born 5 February 1690 in Newbury, died 15 January 1731 in Hampton Falls, New Hampshire; married on 28 May 1713 in Hampton Falls to Mary Greene, daughter of Jacob Greene and Sarah Unknown. She was born 17 April 1693 in Hampton and died about 1763 in Nottingham, New Hampshire. Eight children. Mary remarried to Joseph Macress/Macrest. Generation 3: Jonathan Longfellow, born 23 May 1714 in Nottingham (now Deerfield), died 1774 in Machias, Maine; married on 28 October 1731 in Nottingham (now Deerfield) to Mercy Clark, daughter of Henry Clarke and Elizabeth Greenleaf. She was born 26 December 1714 in Nottingham, and died 1798 in Cornwallis, Nova Scotia. Twelve children. Generation 4: Mary Longfellow, born 15 July 1735 in Hampton Falls, died 1814; married Nathaniel Batchelder, son of Stephen Batchelder and Jane Lamprey. He was born 9 June 1732 in North Hampton, and died 1778 in Valley Forge. Nine children. Heather Wilkinson Rojo, “Surname Saturday ~ LONGFELLOW of Newbury, Massachusetts”, Nutfield Genealogy, posted November 3, 2018, ( https://nutfieldgenealogy.blogspot.com/2018/11/surname-saturday-longfellow-of-newbury.html: accessed [access date]).